camera (Courtesy Happy Acres Photography) One mom's hilarious take on the back-to-school photo. 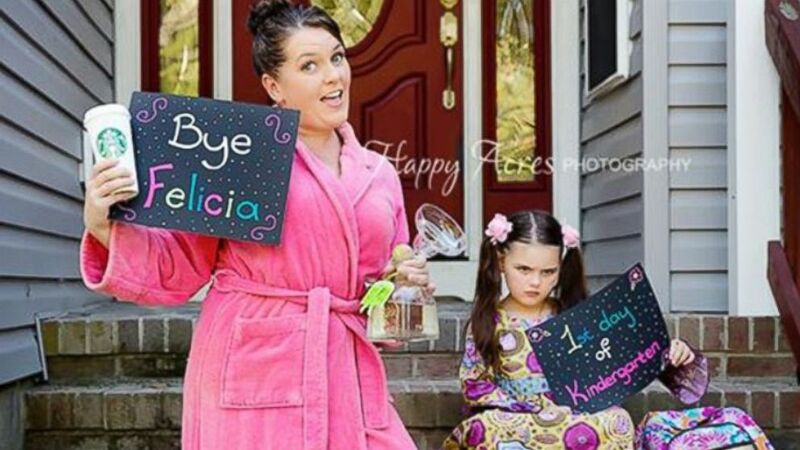 One mom's unsentimental send-off to her daughter on her first day of kindergarten has gone viral, and the feedback's not all good. But there's more to the photo than meets the eye. Jessi Kittrell, a photographer from Gloucester, Virginia, who owns Happy Acres Photography, told ABC News that the emotions surrounding sending her daughter to her very first day of school were mixed at best. "She's my sidekick. We have gone everywhere and done everything together since she was born," Kittrell said. "We go shopping at Walmart at least four times a week." Bailey, or "Bug" as her mom calls her, is the youngest of Kittrell's four children. Her school send-off was bittersweet and the funny photo, her mom said, was as much a coping mechanism as it was done for a laugh. "Bug's got a personality bigger than life," Kittrell said. "I told the principal of her school she should put me on her [the principal's] speed dial." As for being in front of the camera? Bug loves to ham it up. Kittrell asked her friends what would make for a funny back-to-school photo. "I'm a photographer, so obviously the whole thing is completely staged," she said, noting that the photo is filled with inside jokes. The Starbucks coffee is a reference to when the chain opened in their tiny rural town and Kittrell made a beeline to go, even though she doesn't drink coffee. The tequila is because, "I'm always saying I need a margarita," Kittrell said. And the "Bye Felicia" sign? Kittrell said her sister-in-law said it in front of her, and Kittrell had absolutely no idea what she was talking about. But maybe the jokes were a bit too inside. "I get that this is supposed to be a joke but I still think it's wrong," one commenter wrote. "If sending your kid off to school means party time to you, you shouldn't have kids." Bottom line: Kittrell's going to miss Bug an awful lot. "The last couple of days with all the attention over the photo have been a good distraction. It's only now that it's really starting to hit me. I went to Walmart for the first time without her. It was so strange."